The charts below show the percentage of Irish students at one university who spoke an additional language to English from 2000 to 2010. 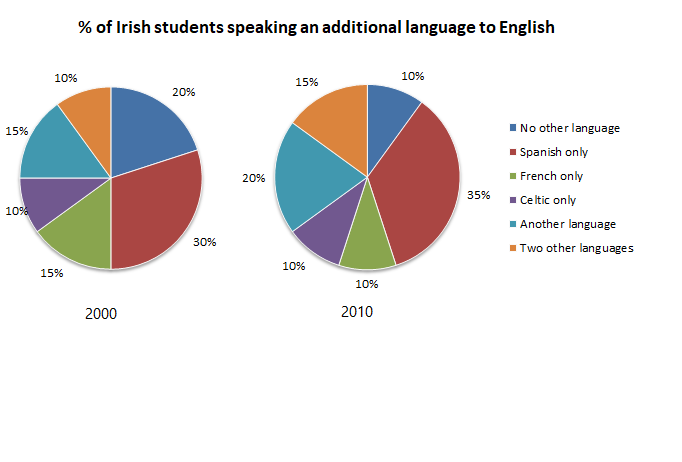 The pie charts illustrate the percentage of Irish students who were able to speak languages other than English at a particular university over a ten year period. Overall, the proportion of students speaking a foreign language had increased by 2010, especially those of European languages closer to Ireland. In 2000, seventy percent of all students were bilingual with Spanish, French and Celtic accounting for over half of all languages spoken by students. While Spanish was certainly the most popular second language (30%), ten percent of students reported speaking three languages that year. Speakers of only one language or another language accounted for 20% and 15% respectively. Ten years later, three in four students spoke a second language at the expense of mono language speakers who declined by half. Spanish remained the most popular second language overall increasing by 5%, meanwhile, the number of trilingual students rose slightly to 15%. Although French decreased slightly, the number of Celtic speakers stayed the same and those who spoke another language recorded a slight rise. This paragraph paraphrases the question using different terms for “an additional language” and stated time. The languages that increased were Spanish and French which are nearest to Ireland. In general, people knowing more than one language had become more numerous by 2010, though single language speakers had declined. Describe each pie chart segment. Group Spanish, French and Celtic together to give the total number of bilingual students and state a general trend for your first sentence. Give details in following sentences. Use comparative language to relate 2010 to 2000. Give the least significant information last. The pie charts illustration the percentage Irish students who were able to speak languages other than English at particular university over ten year period. Overall, the proportion of students speaking a foreign language have increased 2010, especially those of European language closer to Ireland. In 2000, seventy percent of all students were bilingual with Spanish, French and Celtic accounting over half of all languages spoken by students. While Spanish is certainly most popular second language (30%), ten percent of students report speaking three language that year. Speakers of only one language or another language accounted 20% and 15% respectively. Ten years later, three in four students speaking a second language at the expense of mono language speakers who declined half, Spanish remained the most popular second language overall increasing by 5%, meanwhile, the number of trilingual students rose slightly 15%. Although French decreases slightly, the number of Celtic speaker stayed the same and those who speaking another language record a slight rise. Ten years later, three in four students spoke a second language at the expense of mono language speakers who declined by half, Spanish remained the most popular second language overall increasing by 5%, meanwhile, the number of trilingual students rose slightly to 15%. Although French decreased slightly, the number of Celtic speakers stayed the same and those who spoke another language recorded a slight rise. How many speakers were bilingual in 2000? What was the most/least popular tongue spoken in addition to English? What about three languages? Can you think of any other words for language? What about people who can speak one, two or even three languages? What were the changes per segment by 2010? Use the grouping of bilingual and trilingual to make comparing the two charts easier. What trends do you notice by 2010?